Ordinary number signatures Tharin-Chaiwat UNC about 180 - 190 baht. Ordinary number Special code (s) signatures Tharin-Chaiwat UNC about 290 - 310 baht. Ordinary number signatures Somkid-Pridiyathorn UNC about 180 - 190 baht. Solid number 8888888 UNC about 57,000 baht. Solid number 2222222 UNC about 19,000 baht. Fancy number x333333 UNC about 710 - 740 baht. This 50 baht banknote was the first denominations of the 15th series banknotes. It was printed on polimer substrate. 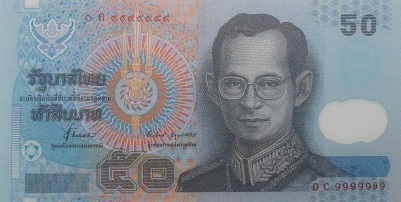 Bank of Thailand issued this type of banknotes on Aug 18th, 1997. The main object is the image of the statue of King Rama 4. The left side is a telescope and a celestial globe. The right side is Phra Pathom Jedi Pagoda. Polimer substrate, raised ink, image watermark, puzzle mark, black light color change ink, microtext.